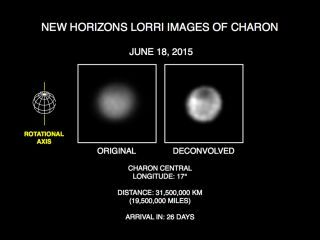 These images taken by New Horizons’ LORRI long-range camera resolve some surface features of Pluto’s largest moon Charon, including an odd dark patch near one of its poles. NASA's New Horizons spacecraft has spotted a strange dark patch at the pole of Pluto's big moon Charon, further whetting researchers' appetites ahead of the probe's epic flyby of the dwarf planet system next month. New Horizons has also detected a rich diversity of terrain types in Pluto's "close approach hemisphere" — the side of the planet New Horizons will zoom past at a distance of just 7,800 miles (12,500 kilometers) on July 14. The newly resolved features, which New Horizons captured in images taken from May 29 through June 19, are visible in a Pluto-Charon video NASA released today. During a mission-update webcast today (June 23), New Horizons team members also reported that the spacecraft performed a course-adjusting engine burn on June 14 that will put the probe in an ideal position to observe Pluto and its moons during the upcoming close encounter. "We need to be arriving at Pluto at the right time and at the right location to maintain geometry for science observations," Gabe Rogers, New Horizon's guidance and control engineer from the Johns Hopkins University Applied Physics Laboratory in Laurel, Maryland, said during today's update. The mission plan includes a specific arrival point, a region roughly 62 miles wide by 93 miles long (100 by 150 km). Rogers said that, before the June 14 engine burn, the spacecraft had been on course to reach Pluto about 80 seconds earlier than planned. New Horizons is zooming along at about 32,000 mph (51,500 km/h), so a mere 80 seconds could put the spacecraft off target by a few hundred kilometers. Stern said the correction was a success, and the probe is on course to "get that hole in one" when it reaches Pluto on July 14. It is highly likely the team will have to make one more course correction before then, Rogers added. In the past week, New Horizon's path to Pluto was declared "all clear" of dust and debris, said Hal Weaver, a project scientist for the mission. Once again, when traveling at over 30,000 mph, a collision with a relatively small rock could seriously damage the spacecraft (which is why it's wearing a bulletproof vest). Weaver said the most recent debris search was the deepest yet and did not turn up any potentially dangerous objects. In addition to looking for hazards, the deep search was also hunting for new satellites around Pluto, but found none. The team will continue to probe for small moons (in addition to the five moons that are already known) in the leadup to closest approach. These images, taken by New Horizons' Long Range Reconnaissance Imager (LORRI), show numerous large-scale features on Pluto's surface. Pluto is one of the largest known objects in the Kuiper belt, a region beyond Neptune that scientists think contains hundreds of thousands of rocky, icy objects. Because Pluto is less than one-fifth the diameter of Earth, and because it orbits an average distance of 3.7 billion miles (5.9 billion km) from the sun, even the most powerful telescopes on or near Earth cannot resolve many details about the dwarf planet's surface. New Horizons will be the first probe to study Pluto up close, providing new information about the object's exact size, its atmospheric composition, the composition of ices on its surface and the topology of its surface. "Anybody who thinks we're going to go to Pluto and find cold, dead rock is in for a rude awakening," said Bill McKinnon, a co-investigator for the New Horizons mission. "I think we're going to find a very dynamic planet."